We all have that Holy Grail item that we yearn to have for our collection, be it a much desired stamp, a cover, or piece of postal history. This piece for one reason or another is beyond our grasp, at least for the present! When I started collecting Albert Decaris stamps I was truly amazed that such beautiful work could, in general, be so inexpensive and relatively easy to procure. But then I started to look at Decaris' work for the French colonies the prices started to rise. Stamps were still within my limited budget, but gathering them would be a slower process. Then I saw it. That one stamp that was priced so high that I never thought I'd have the chance to add it to my collection. And it just so happened to be a most beautiful stamp. A stamp that, upon laying eyes on it, I fell in love with. Isn't that always the way!! 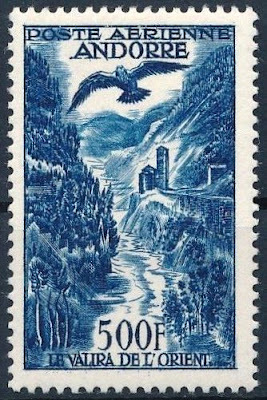 This elusive stamp I speak of - my Holy Grail - is an Airmail stamp for Andorra. The 1957 500f blue, to be precise. This stamp, the highest value in a set of three Airmails, is listed in Stanley Gibbons for £85 mint £90 used. I know a lot of stamps these days don't achieve anywhere near catalogue value. Nevertheless, this stamp still demands a reasonably high price on ebay and Delcampe. A price too rich for me, anyway. Hoping to perhaps snare a bargain, I have watched many ebay auctions with growing disappointment as the prices escalated beyond my reach over and over. This became a very frustrating pattern. So much so that I had pretty much given up on ever adding this beautiful stamp to my collection. It is very true that the other two lower values in the set are the same design and much cheaper. So why not just buy one of those? Well, I could, but quite honestly it just wouldn't be that dream stamp! I hadn't given my Andorra "Holy Grail" much thought for a while until a few days ago when I was talking to a fellow Decaris enthusiast and that particular stamp came up in the conversation. Naturally, this prompted me to embark on another one of my "fruitless searches". Or so I thought! Scrolling through the 1957 Andorra sales, I was not surprised to find nothing within my price range. I couldn't believe it. I was truly stunned. the stamp I had believed would perhaps never sit in my collection. Right in front of me. Within my grasp! Well, I am incredibly pleased to report it here that I am now the proud owner of an Andorra 1957 500f Airmail designed and engraved by Albert Decaris. Isn't it just stunning?